CHARLES ROBBINS was the son of Margaret Robbins. His father’s name is unknown. He was baptised in Littleham by Bideford on 25 Jan 1625/6. When he was seven, his single mother married John Hill in Littleham. A step-sister was born less than a month after the wedding, and another two years later..
John Hill is stated at his burial to be “Clarke of Littleham”. While “Clerk” can mean clergyman, this probably indicates that he was the parish clerk. Littleham is a village 3 miles south of the North Devon port of Bideford. It stands on the River Yeo, just before its confluence with the Torridge. MARY LEY. There is a possible baptism for Mary in Northam, just north of Bideford, on 7 Aug 1625. This Mary was the daughter of Thomas Lee. Though Mary was not born in Littleham, where she married, there were Leys there a generation earlier. The family then seems to have left the parish. One of the sons was Thomas, and it could be that he moved to Northam. Charles’s stepfather died in 1645, during the Civil War. Charles would have been 19. He would probably have had to support his widowed mother. Charles Robbins and Mary Ley were married in Littleham on 6 Dec 1648. 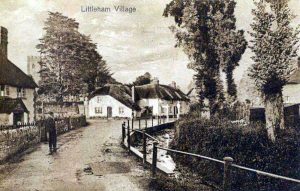 They had two daughters baptised in Littleham. Dyna (or Dinah) died when she was 10. She was buried on 15 Feb 1664. Charles’s mother died the following year. A year later, Mary died. She was probably about 40. The previous year had seen the Great Plague in London and elsewhere. This may account for some of these deaths. The parish was frequently called upon to support collections for unfortunate people both at home or abroad. It might be a devastating fire in a town or village, or persecuted Protestants in Ireland. The Littleham parish register records “An Account of the Severall Sums of money that were given by the Parishioners towards the Redemption of ye Xtian Slaves in Turky. Feb the 19th 1670.” Unlike other collections, it does not just record the total sum, but lists the contribution made by each parishioner. They range from 5s to 6d. Charles Robins is down as giving 6d. This probably means that he was a labourer, or a similarly low-paid worker. Paul Hill, who may be his stepbrother, gave 1s and his wife Edith 6d. The Hills appear to be a better-off family, though by no means rich. Charles died in 1695, at the age of 69.